And … we have achieved wiki. Thanks to sannse (and Jimbo) at Wikia, we now have a brand-new shiny vintage sewing patterns wiki! I really wanted one place where people could collect information about vintage patterns, and the wiki is, I hope, going to be that place. — tags or categories that describe the pattern, like "midriff band" or "collar"
The wiki is VERY rough right now, with only a few articles up, but I wanted to throw it open to everyone as soon as possible so that we can grow! So right now you might be asking yourself, "What can I do to help create this resource?" That's easy! You can start new articles. 1. Go to the wiki. 2. Choose a username and log in! 3. Look at the articles that are there. Have a favorite vintage OUT OF PRINT pattern that's not listed? 4. Create a new article for that pattern. Article titles should be the pattern manufacturer and number, e.g., "Butterick 6015"
Otherwise, please only use pattern images you have scanned or photographed yourself, or of patterns you have purchased. Please respect the wishes of other sellers who do not want their images used this way! 6. Include some information about the pattern, especially links to reviews, blog posts, Flickr photos, etc. Don't worry about making mistakes! It's a wiki! Whatever gets broken, we can fix! Right now we don't have a lot of rules or "right" ways to do things … if we need 'em, we'll work 'em up, but I think the Golden Rule works for a lot of situations, including wikis. One last thing: I don't OWN this wiki. It's not mine, I don't get any money from it nor will I. It's something for the community of people who love vintage patterns to build, share, and have fun with. Everyone should feel encouraged to participate! Great idea! There’s something funky in Firefox, though. The boxes on the right side overlap the middle column (covering up part of the scissors, among other things). No, I’m not volunteering to fix it. I might break it more. Yay, I’m in! I am such a wikifile – and such a complete geek. Brilliant idea. this really is fantastic. i want to go upload all my vintage patterns right this very second. Oh dear! I already have a conundrum. What if you desperately want to purchase a pattern and want there to be a listing for it so you can keep an eye on information about it, but didn’t take the picture of it, so don’t own the picture, so can’t post the picture, so can’t make the listing? I am dying to get ahold of Butterick 6737 of “Looking Delightful” on October 8. What to do? Hey Tea, I made the page. Go log in and add your username to the wishlist! Why not a picture of the back of the envelope? Hi Ladygrande … good question. A couple of people have commented that with the back of the envelope, a sufficiently motivated person could draft their own copy … so in order to encourage sellers to allow us to use their images, I’d like to limit it to the front of the envelope for now. If you have your own front/back images feel free to upload ’em! As I have a massive lack of time currently to contribute to the wiki at this point, I too offer my scans of vintage/retro patterns from http://www.MoonwishesStore.com for any who would like to add them in themselves as long as proper acknowledgement is made. This is a fantastic idea! I’m not too knowledgeable on editing wikis (yet) but I do enjoy posting photos of my vintage patterns! Thanks for doing this. I think I got it figured out and did 2 entries. I figured out I don’t have any problems inserting photos if I use the “Create article” box at the BOTTOM of the main page (instead of the “Create a new article” link at the top). What a great idea Erin! kinda like Ravelry for vintage sewers. er, I mean, sewers of vintage patterns. Oooo! Great idea! Can’t wait to see what else is in store.Also, I mustly lurk, but I am a long-time sewer and lover of vintage patterns. Also? WordPress geek. So if you need any kind of help in that area, let me know. Thanks so much for sharing this Erin. 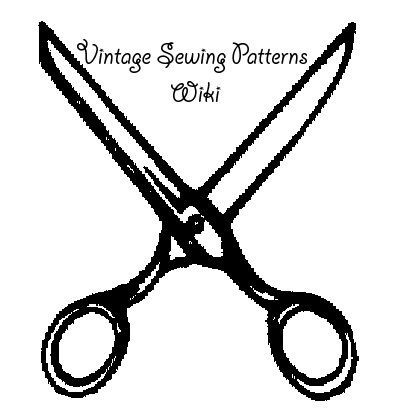 It’s very exciting!I’m looking forward to uploading my vintage patterns, and seeing how the wiki develops over time. Of course there’s a “pockets” category. Of COURSE!Erin, is this your new Google Book Search? Yay! I plan to take a look at this once I have more time, and I’ll upload what I can. I have a question – is there any collaberation with the folks at patternreview? there are many vintage patterns printed there, could you adverstise to those users somehow? Tina, you can add more info to any page by clicking on the “edit” button at the top of the page. I went ahead and added the basic section headings (“Links to reviews/blog posts”, “Sources”, and “Wishlist”) to the page you just created. If you have this pattern for sale, you can now click the “edit” link next to the “Sources” heading, and put a link to your store there. If the inside pattern pages that clearly show the pattern pieces can also be added to the pattern site by those who have access to the inside sheets, that would really be an excellent tool for drafting a copy garment. The pattern pieces also give some clues into the true shape of the garment.